A new video from content creator, writer, and performer Dylan Marron called "Men Kissing Men" promises to donate money to the OneOrlando fund based on the number of homophobic comments left on the video. The video is just one response Marron has had in the wake of the Pulse nightclub shooting in Orlando on June 12; last week, he launched the "Queer Self Love" Twitter hashtag as well. Like YouTuber Hannah Hart's video about the shooting, "Men Kissing Men" is a powerful reminder for us to move beyond the oft-repeated refrain of "thoughts and prayers" — to take action. The video, created by Marron for Seriously.TV, depicts numerous male couples embracing and kissing one another proudly interspersed with signs held up by Marron discussing the purpose behind the video. As he explains on his handwritten notecards, Marron knew that many people who watched the video would immediately be turned off by the sight of two men kissing; indeed, it's more than likely that many may even leave hateful, homophobic comments on the post. So, he's using that relative certainty for the forces of good: If you watch the entire video, you learn that his plan is to donate $1 for every homophobic comment the video sees. From skimming the comments on the video myself, I was pleasantly surprised to see that many of the "homophobic" comments are being left in the same spirit as the video's creation: A number of them are coming from queer-indentified people literally commenting "homophobic comment" to increase the donation amount for those impacted by Orlando. As of this writing, "Men Kissing Men" has garnered over 10 million views, over 100,000 "likes," and nearly 100,000 comments. Violence against men who kiss one another — and, for that matter, violence against LGBTQ people in general — is not uncommon. According to data retrieved by the FBI, for example, sexual orientation motivated roughly 20 percent of all hate crimes in 2013. Of course, proving that something is a hate crime is no easy feat, and violence against the LGBTQ community is often underreported. As a lesbian myself, I know first hand the risk of displaying affection with a partner in public, as I've encountered threats of violence, harassment, and stalking after showing affection with another woman and "outing" myself to those around us. This is another reason, of course, why queer safe spaces are such important sanctuaries, and why the shooting at Pulse in Orlando is even more tragic and disturbing: With so much of the world feeling unsafe for LGBTQ people, a violent crime occurring in one of our few safe spaces hits hard. 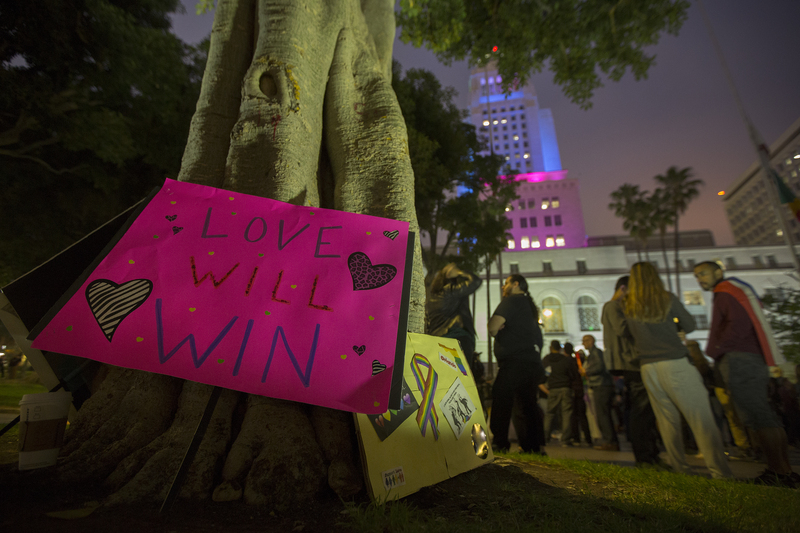 As both the LGBTQ community and the nation at large begin to heal after Orlando, many queer activists and allies have stepped up to organize aid for the victims, their families and loved ones, and the general LGBTQ community in Orlando. While people can absolutely support those impacted by this horrific act in ways other than donating money, such as donating blood, organizing vigils, or educating their peers on the general violence against the LGBTQ community, there is also a serious need for financial relief for those impacted by the shooting. For many families, things like funeral or travel expenses are terrifyingly steep, and dealing with finances while grieving only adds stress to what is already a nightmare situation. Marron's video does a great job of balancing activism and awareness with a specific route to helping those impacted by the shooting. Here are a few more ways to help Orlando and how to support the LGBTQIA+ community — because we can all do more than "thoughts and prayers."